Heat a large skillet over medium high heat and add butter to melt. Combine flour, salt and pepper in a large Ziploc bag. Add ribs and shake to coat with flour. Once the butter is melted and starting to bubble, add short ribs and let brown each side, turning after a few minutes on each side with tongs. 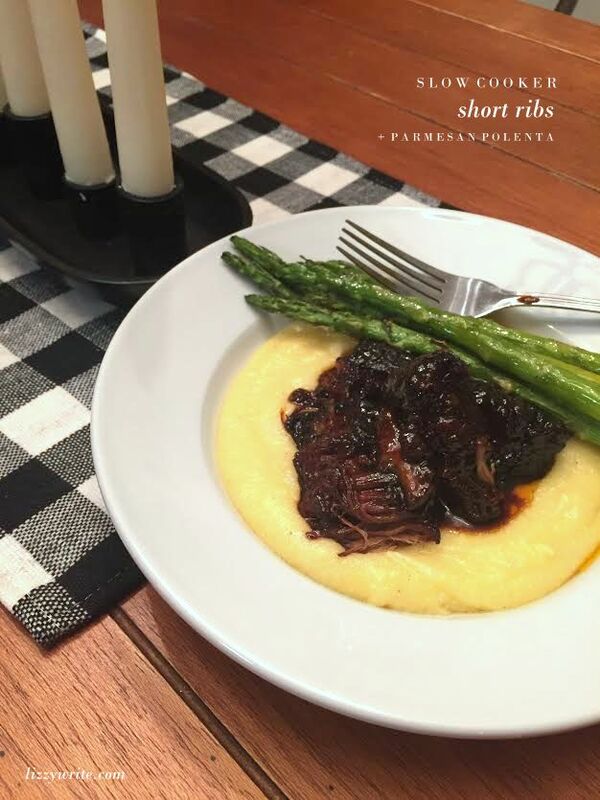 Place short ribs in a slow cooker. In the same skillet, add onions and saute for 3 minutes. Stir in the rest of the ingredients, scraping all the drippings together. Bring the mixture to a boil and pour over short ribs. Cover and cook on low for 9 hours. Carefully flip the short ribs over about half way through. Bring the water to a boil in a medium pot. Reduce heat to medium and slowly pour cornmeal into the boiling water, while whisking continuously to prevent lumps. Reduce heat to simmer and let cook for 10-15 minutes, stirring often. Stir in salt, pepper and Parmesan and serve with short ribs and sauce on top. Looks amazing! I will definitely have to make this! Thanks Liz!